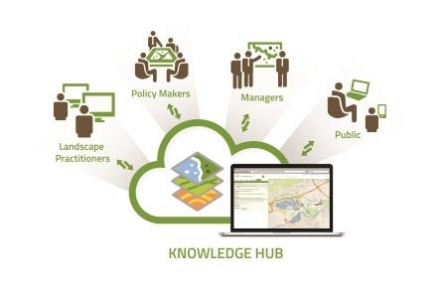 Cultural Landscapes Blog›What Can The Knowledge Hub Do For You? 'Since the first introductions on Hercules were laid out to stakeholders and indeed family, friends and colleagues, there was always in evidence an 'eye widening' moment when the knowledge hub was mentioned. The huge potential of this tool is quickly realised. But importantly the potential seen is very is different to each individual. For myself and many other land management practitioners the lure of a 'one stop shop' to gather all the layers needed towards an as comprehensive as possible set of map layers before moving 'on site' is a huge time saver. To have relevant academic study linked in was a huge bonus. To also be able to record the work done by yourself is advantageous, particularly in these times of social media. But it also became apparent that many others were thinking differently, matching their interests with a map based site that sits so comfortably between all inclusive international sites and very specialised single profession or interest sites. Effectively all of us with landscape interests can both plan our work and leisure pursuits increasingly more easily using the Knowledge Hub as it expands and evolves. But one issue, so important, yet considered by many as almost impossible to define in text and therefore policy making, is how to record meanings associated with a particular place or feature in our landscapes held by one particular person, family or community. These meanings and values are vital to land managers but so difficult to measure in at the planning stage. This can lead to and has led to costly conflict. So to simply hone into a particular location and be able to read what that place or something therein means to somebody, anybody, has the potential to not just save someone's landscape but save money! To pinpoint a specific location in a landscape with a link to a photo or just a simple message such as 'My father's ashes were spread here' is something no one can ignore. It is easy to be cynical about this, to believe that a special, often personal, attachment to a tree, hedgerow, viewpoint etc., is never taken on board by any land practitioner or land owner - but this really isn't true in the main. We practitioners and others are really not that callous - we simply lack the information required - the 'Knowledge'. Of course there will always be 'weighing up' of arguments as there should be with good planning - but the Knowledge Hub data can help in quickly providing all the necessary base information for effective local debate, preventing things from being bundled into the ever churning washing machine of a media controlled fight with taxpayers money being fed endlessly into the cash slot. To discover the Knowledge Hub, click HERE!